Global Pet Expo 2015 is coming – Bigger and Better than last year! GPE 2014 had 1000+ exhibitors. In 2015 there are 6.5% more, reinforcing its position as the premier annual show in the pet industry. Of course, most of you will be attending. This will be my 27th consecutive year. After attending a number of these shows in combination with SuperZoo, you sometimes begin to think that you “have seen it all”. If any attendees are feeling that way, consider this. Over 500 of the GPE 2015 exhibitors did not exhibit at SuperZoo 2014 and over 300 were not at last year’s GPE. Even if you attended one or both of those shows, GPE 2015 has a “lot of new”. 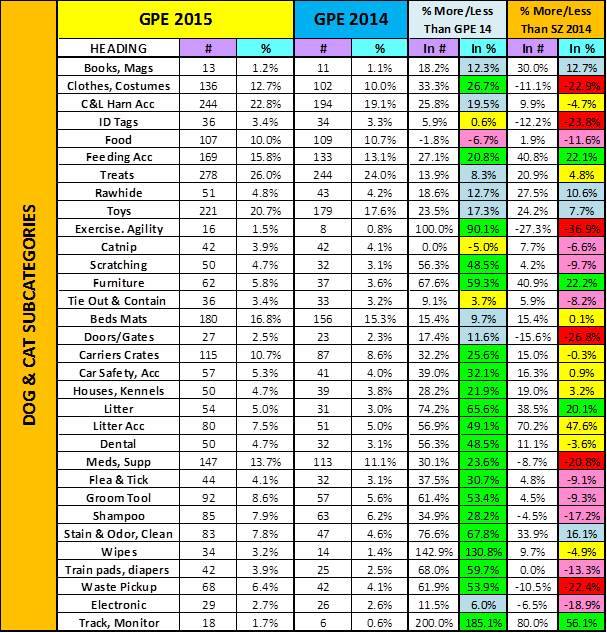 Let’s take a look at the exhibitor type and product mix and compare it to both last year’s GPE and SuperZoo 2014. Both shows have designated floor sections which pull together exhibitors with a common theme. Other than this segregation, neither show segregates the other booths in any way. The chart below and the ones that follow show the exhibitor count, % of total booths and directly compare GPE 2015 to GPE 2014. In the comparison to SuperZoo we only show the % difference. Please note that this information is based upon data that was available from the APPA website as of 2/4/15. There are a few exhibitors which are committed to the show but not “on the site” as yet. This number is so small that it will not make a significant difference in this analysis. GPE has 5 floor sections and SuperZoo has 7 (Grooming, Critters & Equine). They have 4 sections in common. Natural – The growth of this industry is readily apparent. GPE has almost 50% more exhibitors than last year and is approaching SuperZoo’s numbers. Boutique – GPE’s fashion section is slightly smaller than last year and considerably below SZ. Aquatic – GPE is traditionally strong in aquatic and this section is almost twice as large as SZ. New Vendors – Wow! 146 exhibitors. GPE is definitely about new. International (GPE Only) – A little uptick from last year, but basically the same. A word of caution: Just because a section is smaller, doesn’t mean that there are fewer exhibitors offering products in this category. It can indicate that Companies have broadened their product listings and have opted to not be segregated by only a part of their portfolio. Now we come to classifications that I have made. As many of you know, I developed a search tool for SuperZoo which allows attendees to plan out their work on the floor by the products that they are interested in seeing. It allows up to 5 simultaneous searches to be run concurrently then generates the results in alpha or booth# order. I have developed one for GPE and it will be released next week! At all shows, Cats are Royalty …but Dogs Rule! However, GPE has significantly improved the number of booths with cat products. GPE slightly improved its offerings in Fish, Bird, Small Animal and Equine and is significantly greater than Superzoo in all of these but Equine. GPE has big increases in Distributors, Business Services and “Gift”. SuperZoo still has significantly more of all three which reflects their long history with independent retailers. However, GPE is on the way up. 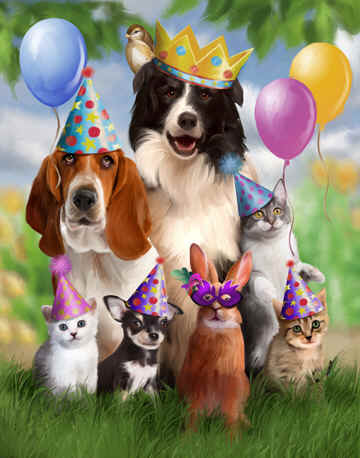 Dogs and Cats are the unquestioned royalty of Pet. I have divided products designed for them into 32 subcategories. Here are this year’s top 10 for GPE. The major difference between GPE 15 and GPE 14 is that Food fell 2 spots and Shampoos dropped out of the top 10, replaced by Grooming Tools. All of these categories except Food increased in both number of booths and share of space. Vs SuperZoo, the top 4 are mirror images. SuperZoo has a significantly greater amount of fashion and meds/supplements. 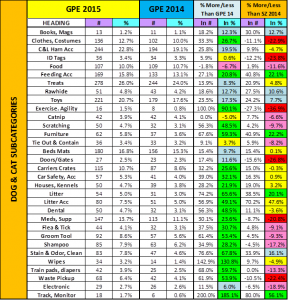 The specific categories for Dog/Cat products and a comparison between GPE 15 and GPE 14 as well as Superzoo follows. Take a look at the categories that are of interest to you. Note: There are some extraordinarily large increases in some categories from last year’s GPE. When I put this list together for GPE 2014, I relied on the product listing in the show website. Last year for Superzoo, I began double checking the listing against the company website. Often there is a big difference. The data input for GPE 2015 and SuperZoo 2014 were derived from the show listings AND visits to over 1000 websites – per show. They’re not 100% accurate, but close. Although this post is primarily about GPE 2015, don’t “discount” SuperZoo. Both shows are great and actively trying to become better. New and different is not limited to GPE. Last year, SuperZoo had over 350 exhibitors that didn’t attend GPE. They are both integral parts of the Pet Industry…and I think you can appreciate their complexity. Regardless of why you are attending the GPE, having a productive show requires planning. It’s too big to just “wing it”. In my next post, I will make available a “GPE Super Search” tool for download. Take a look. It can’t hurt…and it just might help!